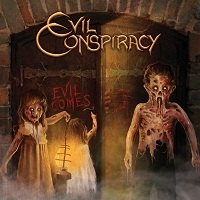 This is the second full-length album from the Swedish Powerhouses EVIL CONSPIRACY. They have been at it since 2002 releasing a number of demos but never really putting out a full album until 2014 with the release of ‘’Prime Evil’’. They are an old school heavy metal, no rhyme or reason, it’s straight up Heavy Metal. They channel a number of different bands and it forged a unique sound that is current but also has deep roots in the history of the genre. It’s not going to reinvent the wheel that’s for sure. They are deeply rooted in a lot of different subgenres and they put a lot of time and effort in forging the band’s sound. When you listen to the first notes of this album, you get transported in the early 80’s, pre-Thrash Metal sound like bands like ACCEPT, SAVATAGE and SAXON. Some songs could have been sung by Udo Dirkschneider back in the day and they would have sounded as good as this band has done on their second release. You can hear that old school vibe but also I thought a number of the songs of this album were very reminiscent of what Rob Halford does in his solo career. The songs from the HALFORD albums are more straight up heavy Metal and a bit slower than his JUDAS PRIEST counterparts. Hell, there is actually two songs from this album that have the same titles as previous HALFORD songs! But I digress, this is only an observation and not a critic at all. The album is well balanced, I listened to the album 4-5 times and its goes past swiftly. It’s more an homage to the roots of Heavy Metal and it’s not the most original sound out there but it’s highly enjoyable Headbanging stuff and it gets your juices flowing and that’s what heavy metal does. An enjoyable album from a more obscure band that could breakout in the new year!